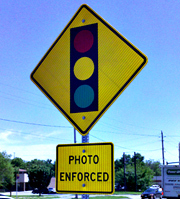 Another city has voted to use red light cameras. The city council in Iowa City took its third and final vote Tuesday on adding red light cameras, and it passed by a 4-3 margin. The police department says the cameras will go up at approximately 10 intersections that are the most dangerous based on crash data. The city still has to decide how much they’ll charge violators and how the fine money will be used. Iowa City will become the seventh city to use the automated devices which have proven to be controversial. Legislators have discussed putting a limit on how much cities can charge for speed or red light camera tickets, and a bill is currently in the works that if passed would ban the cameras altogether. Council Bluffs, Sioux City, Muscatine, Cedar Rapids and Davenport also use the cameras. Des Moines, the state’s largest city, took in over $192,000 in revenue from its traffic cameras in December. City leaders say the cameras have reduced accidents. Leaders in Sioux City recently voted to lower the fines they charge for red light camera violations from $195 to $100 dollars if the violator agrees to pay right away. Sioux City expects to take in over one million dollars from its red light cameras.